On Saturday the 26th, Yixue Yang and I went to the Ting Wong Restaurant in Philadelphia's Chinatown. 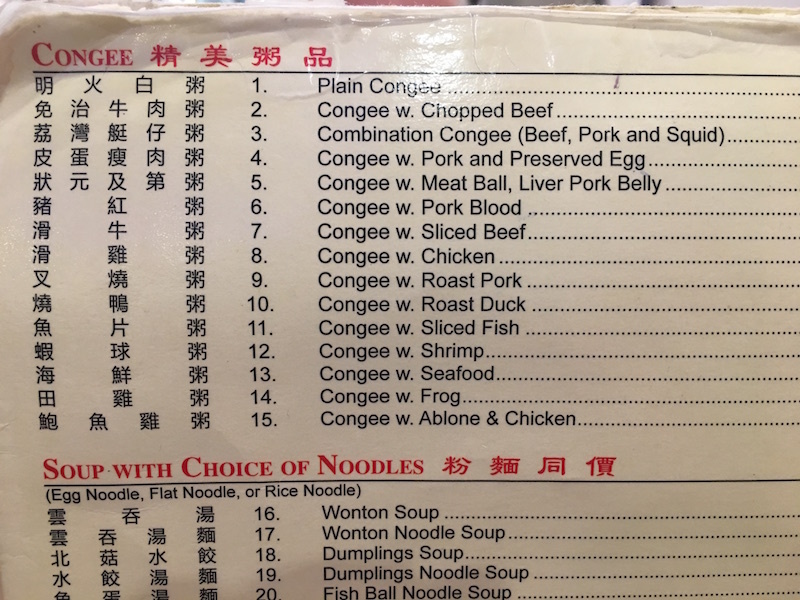 I took one look at the menu and knew right away that the first thing I wanted was the second item on the menu, the Congee with Chopped Beef. Since I began the study of Chinese languages half a century ago, there's one word that I have found very useful and versatile, but extremely hard to translate into English, so in this post I'm going to propose that we might as well just simply (gāncuì 乾脆 = the previous five English words) borrow it into English and be done with it. That word is the almighty, inimitable, the one and only: lìhài! From The Economist, November 19th, 2016, "China" section, page 59 of British edition. This is a guest post by Bill Badecker, Linguistics Program Director at the National Science Foundation. “As the car is hurtling towards the cliff, it’s driving on quicksand,” Levitt said. In "Life is Meaningless, Say China’s Top Students: A Peking University professor reports that students have full course loads and ‘empty hearts’", Fu Danni (Sixth Tone, 11/23/16) introduces us to a newly minted term: kōngxīn bìng 空心病 ("empty heart disease"). Reports of the death of languages and the extinction of languages are alarmingly routine, but before a language dies out entirely, when it is endangered, its dialects die off one by one. The list of publications documenting the dead and dying dialects could go on for many pages: I lament each and every one of them. Speaking of biscriptalism, Guy Almog called my attention to an interesting project called Aravrit (that is, Arabic + Hebrew [ivrit]). Aravrit is a project of utopian nature. It presents a set of hybrid letters merging Hebrew and Arabic. This new writing system is composed of an Arabic letter on the upper half and a Hebrew letter on the bottom half. The characteristic features of each letter were retained, however in both languages the fusion required some compromises to be made, yet maintaining readability and with limited detriment to the original script. In Aravrit, one can read the language he/she chooses, without ignoring the other one, which is always present. Judging from Aravrit's Facebook page, many of the details of this new, hybrid script were inspired by features found on Yemenite manuscripts.